I have been with a small company for almost 5 years now. I was quite young when I began, and was initially brought on as an assistant to a program director. This was the first job I had after university, on the other side of the country from my home, friends and family. I am now a manager myself and report directly to the principal of the company as does my ex-boss. Lately it has become apparent that this director is pretty incompetent. Part of the exposure is due to the fact that I no longer assist/complete his work. I inadvertently mentioned to a co-worker how this director used to treat me, and now she insists she must do something. My concern is around whether or not his behavior is criminal or if he is just ‘not a nice person’ to work with. Over the years there were some slight inappropriate behaviors, but nothing physical. Mainly off-handed comments about other people that made me feel uncomfortable. He was after all 40 years my senior. What really affected me for a long time was his mental abuse and manipulation. He wanted to mentor me, unbeknownst to the principal, for the director’s job. It was done in such a way, that I was supposed to feel lucky and do whatever he thought was required. I’ve combed through your site, and he fits the overly political animal to a tee! Very egotistical, is a master of words, premeditates situations, and would create scenarios in which I was tested. He went as far as to make fun of my clothes and accused me of having an affair with another co-worker. Eventually, I informed him I could no longer move forward with this ‘mentorship’. I made it clear that I was interested in management, but not his way. Things began to change. Although he told management I would never be interested, I have since moved up on my own. Is this the type of behavior someone can be reprimanded for or is it too intangible to report? I fear my co-worker is putting too much weight on the sexual harassment side, when in fact his crime was equally as appalling but more difficult to pinpoint. Well done to this point. You have handled an incredibly difficult situation in a mature, firm way and it seems to have been very effective. This does not mean that we would advise you to take it further. You seem to have analyzed this pretty close to how we would. This man is probably a skilled overly political person. Not all overly political people are. Some of them are transparent and make visible mistakes. While this person is annoyingly patronizing and a borderline harasser we agree with your thought that the behavior is not clear enough to pursue the course of action your colleague is recommending. We say this for 2 reasons. One, the behavior may be so vague and subjective that it would be hard to prove. Two, there is a high risk that it would backfire. So our advice would be to tell your colleague that you do not want her to pursue it. You are now in a great position and it looks like he will not be bothering you going forward. Should any negative behaviors towards you continue, then it would be good to start documenting what was said, written etc., and who witnessed it in case you decide to take action later. 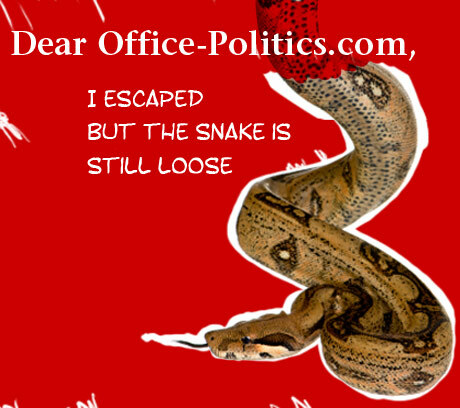 Thanks for writing to Office-Politics. Thanks! This is great. I actually had already decided not to move further, but did talk to HR about some things, just to put them on record. This is really helpful and I have since realized he’s a bully. And there are no laws against that in Canada yet. I hear you. I had a micromanager who may have tried some inappropriate behavior but realized it was a step in the wrong direction from my reaction. When somebody questioned why a document was late — seemingly my fault — the situation was reported to me as the manager defending me when it was micromanagement at fault. Eventually I was moved to a job where I got kudos for timeliness and customer service, and the manager was reassigned with nobody to micromanage and no impact of procrastination. There may have been misbehavior that played a role in the procrastination and if I had first-hand knowledge of it I probably should have reported it. A person who, I know, had first hand evidence did not report it. That’s the position of your co-worker who thinks HR should be notified — it has to come from somebody with first hand evidence. I think as far as you’re concerned, the problem is over. Obviously upper management now knows your ex-boss is at best marginal and probably also hurting the company. Think about this: are they sweeping it under the rug? Or have they done something more active about your ex-boss by this time? Do you think your experience will help you as you rise in the company, so that somebody else doesn’t go through 5 years of such “mentorship” and so that you have directorial support in whatever you can do about it? p.s. to Canada — does that mean there are no laws about hostile workplace harassment in Canada or just that it has to be related to gender, race, ethnic group, etc? I think it’s pretty much been swept under the rug, other than checking in with me, perhaps to try and keep me feeling tended to. We are a small company and there are not a whole lot of places to move up, so I will likely move on eventually. That being said, in the future I am confident I could smell one of these types of people a mile away. Phewf! Workplace bullying and other disrespectful behaviour, commonly known as “personal” harassment is not covered. It isn’t in most of the United States either, except a few. I intend to do what I can to help find a place for workplace bullying in the Human Rights Law…It’s a horrible experience to go through, that can do quite a bit of damage to a person, mentally and emotionally. There are alot of support websites in CAN/US now.